Bruce Springsteen is one of the few international rock superstars who has consistently toured in Finland. Many of my friends have seen several of his shows in Helsinki, while other performers of the same caliber are always missed. Springsteen, however, has some kind of special relationship with the fans here. A few years ago, he played an extra 30 minute acoustic show before the actual concert began - and then went on to perform for over four hours with The E Street Band. According to the sources that keep track of trivia such as this, it was the longest concert in his career. As you can tell, I'm a relatively casual fan of "The Boss". I've never seen him live and I don't own any of his albums. 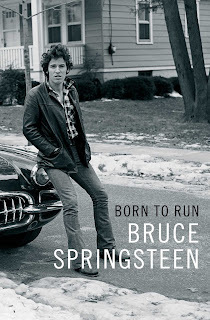 Born to Run (the album) is an amazing piece of rock and roll, but his other albums have never really hit home. I picked up Born to Run (the book) purely based on some positive reviews I'd seen but it really blew me away. The biggest reason I never completely bought into the whole Springsteen mythos was that I found his lyrics silly and overwrought. I always had trouble believing that the things he was singing about - the cars, the girls, back alleys, small towns - were actually important to him. For some reason, I had always assumed that it was his way of pandering to the American lower middle class. That he wasn't singing with a straight face. How could he be serious? Turns out that he was serious all the way through. That realisation made me re-examine his music from a whole new perspective. Springsteen has apparently been sincere from the very beginning. He wrote from his heart about the things moved him and lived his life more or less as his songs' characters do. He wasn't trying to fool the gullible working class into buying his albums. He wasn't trying to establish himself as a specific kind of folk hero. It was always about the music, the energy, the freedom and the crowd's reaction to him putting everything he had into his shows. Underneath all the showmanship and passion, Springsteen was a restless soul and worrywart. He suffered from depression, every time he was forced to retire home from long tours. His soul wanted to be on the road constantly. But he also wanted to have a family, something that his own parents had never been able to provide him with. His father's schizophrenia only became apparent once Bruce was an adult and then it was already too late to truly reconcile. Sometimes it's difficult to separate the man from the myth. Some will be sceptical of even this work because it might only serve as an attempt to play up the mystery of The Boss. But looking at how he played the marathon set in Helsinki at the age of 65, I'm having a hard time believing that Born to Run doesn't represent who he really is. He even gives a reason for playing those long shows: he's afraid that he's not giving enough, that people will be disappointed. His insecurities can only be put away by playing until the sun goes down.